Given the number of crazy posts I had on the old Monteith page, I suspect that Monteith Correction Facility used to be a source of …”interesting” comments before I upgraded the comment system. Monteith is about 20 kilometres northwest of Matheson (on Highway 11), and 11 kilometres south of Iroquois Falls. Most people see places like Monteith as dots-on-the-map, but if you look behind the map you’ll find that places like these often have some pretty neat histories. Monteith was founded in 1916 as Driftwood City (the ‘city’ part obviously debatable to some ) but was destroyed by fire soon after. The town (‘town’ less debateable) was then rebuilt as the home of a demonstration farm. I’ve been told that the town was named Monteith after a former Provincial Minister of Agriculture.Val Gagné is a largely francophone hamlet of about 50 houses 30 minutes south of Iroquois Falls. The demonstration farm was eventually converted into a military training centre, which was then used as a boarding school, which was then turned into an abandoned boarding school, which then turned into a jail, which then turned into a World War II Prisoner-of-War camp, which then turned back into a jail. Paul emailed in to tell me that during the summer of ’64 or ’65 there was an iron ore discovery north of Timmins. This was quite a rich find, and was followed by a huge smelter being built just outside of Timmins. The find of iron ore sparked speculators and claim staking in an area of approx. 40 – 50 miles all around Timmins. There were literally hundreds and hundreds of claims staked. Apparently, a Toronto Star reporter with a vivid imagination described the exploration boom with the following headline: “Startled guards at the Monteith Correctional Centre discovered miners tunnelling underneath the jail in search of iron ore”. Of course it wasn’t true. Apparently somebody must have fed that reporter quite a line, but it was good for a few laughs. (I guess they didn’t check sources in those days). I’ve only been to Monteith once, so I haven’t done a tonne of exploring. I counted maybe 20 houses (there are probably more, I always seem to under-count and get emails later) there is the Mary Magdalene Church (pictured), an old playground, a pop machine, and oddly enough a totally random garden centre. There;s probably more I just didn’t get to see it that day. Val Gagne isn’t directly on Highway 11 – it’s about a 10 minute drive east of the main highway. Val Gagné is one of many tiny little farming communities that typifies northern Temiskaming. In town, Sunshine Café and Variety on rue Principale serves cold beer and also has an LCBO outlet. Last time I was there the store was for sale (I know a lot of people who would love to own their own liquor store, just maybe not in Val Gagné.) There are a few other businesses, including Guay’s Garage, a caisse, a foodmart, and of course, a church. 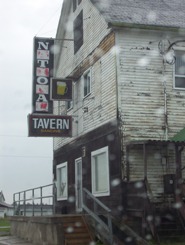 I took a photo of the old National Tavern as a tribute to the town’s past. I thought it was shut down and boarded up, but in fact I’ve been told that it’s still open. Val Gagné apparently has one of the nicest baseball fields in all of Ontario and hosts an annual baseball tournament on the August long weekend named Val Gagné Days. There is also an annual corn roast that attracts 10 000 people from across the north. If you explore the cemetery there is a statue to be found commemorating the people who died in the Great Fire of 1916. A former Val Gagné resident emailed me regarding the website and alerted me to the fact that I’m making their hometown (and many others) seem like a “ramshackle collection of abandoned huts”. While that’s definitely not the case, nor the intent (at least not on purpose) there may be more to the town than met my eye that rainy afternoon in August. This entry was posted in Temiskaming and tagged dot on the map, francophone by Highway11.ca Editor. Bookmark the permalink. Just wondering if anyone remembers the large corn roast that was hosted by a local farmer? If so, does anyone know which farm or field it was held in. Met my wife of 20+ years there and would like to visit. Starting this year we are having a Winter Carnival starting on 23 march to 25 march 2012.THe old co-op is torn down now.We had many changes since I moved here as a little girl.Moved away when I was 18yrs for 12yrs,then I came back to my beautiful village. 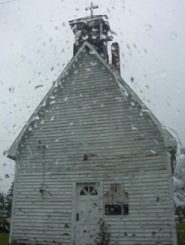 My father was born here and he would be going on 79 yrs old this winter.He took over the family business of farming,but sadly he passed away in 1997 at the young age of 62.There is no more Co-op,corn roast and the school just shut down about 2 weeks ago.New people from the south are coming to live here now while others are moving for new jobs,warm weather.We still have Val-Gagne Days in August,a carnival in February. my father roger boucher,son of albert boucher was born in val gagne. many many many memories of beautiful family gatherings filled with beautiful music and lots of laughter.my mom florence lefevre was born in iroquois falls , so we still have lots of family there and love to visit. Re: Raymond Michaud. He livs in Matheson. His brother Paul on the 11 between Matheson and Monteith. Try Michaud Trucking in Monteith. His daughter is also near Matheson. I returned to Val Gagne for a visit last summer and there has been a lot of changes…my gosh…there is hardly anything left that I remember. We went to the cemetary and drove around. Noticed that there was no more stores also….wow…where do you guys shop? Being raised there,memories include Lacombe store, the bowling alley, dances at the hall and the school. Most of all, growing up on a farm. Small communities are good to live in but require a lot of travelling for most things. I recently spent 2 evenings in Val Gagne, and although I am from a “Big City” in the US, I was well impressed with the people from the area. Being from the South, I felt right at home with very hospitable people, and a beautiful part of the country. I visited & lived in val G for during the 90′s also worked at monteith. Kids ahd fun at the local school they ahd fun at the playground skating rink dog sled races swim in the local water hole just outta town, walk in the woods old fields toboggan behind the house hill skidoo in the fields walk tothe post office or co op food store it was nice now lots closed up the families are smaller not 15 kids and less work to keep people in these small towns sad in many ways…………. Hiya, I’m really glad I’ve found this iafmrontion. Nowadays bloggers publish only about gossips and internet and this is actually irritating. A good website with interesting content, that is what I need. Thanks for keeping this site, I will be visiting it. Do you do newsletters? Cant find it. My mom and dad both grew up in val gagne and I have many relatives that still live there.Most of the people buried there are related to me. I have good memories of val gagne. My grandparents were Alma and Lawrence Lupien who lived in Val Gagne all their lives. They had 10 or 11 children, 8 who survived. They were Henry, Violet , Beatice, Irene, Maurice, Florence, Rose and Lawrence. There is a road on the way to their old farm called Lupien Road. My mother Rose bought the farm from her father around 1965 and owned it until her death in 2012 when it came to me, my sister and brother who insisted it be sold. Two against one and majority ruled. I have so many wonderful memories of summers at the farm when you could hear a car coming for 10 minutes before it crested the hill and we would all be so excited to see who was coming. My Grandparents never had electricity or running water but it didn’t matter and we didn’t really miss it considering we were ‘city folks from Toronto’ or the ‘south’ So happy to see this site and read some of the stories from Val Gagne. I’m your uncle Larry’s daughter Brenda. Don’t know if you remember me. I have a lot of the same memory. Please try to contact me. i live in V-G its awsome i love the baseball especially at V-G days something else to look forward to in the winter is the new sponge puck tournaments!! I live in Val Gagne and i have to say i love it here. The Country bar and inn has great food and great service. and everyone here is so nice we have been made feel very welcome here and we just love it. I’m originaly from Val Gagn√à and still have relatives living in the community. FYI – some of the information is outdated.